April 29th marks the 2nd anniversary of Sparkfest – A community event that brings the community together to celebrate youth and young female mentors, and to promote SWOVA’s work with young women and men in the community. Sparkfest has matured and developed just like this year’s Pass It On program. This year, we’ve invited community women in to share their talents and this year’s Sparkfest is inviting female performers from the community to bring voice to their passion, during an intimate dessert and mocktail event. 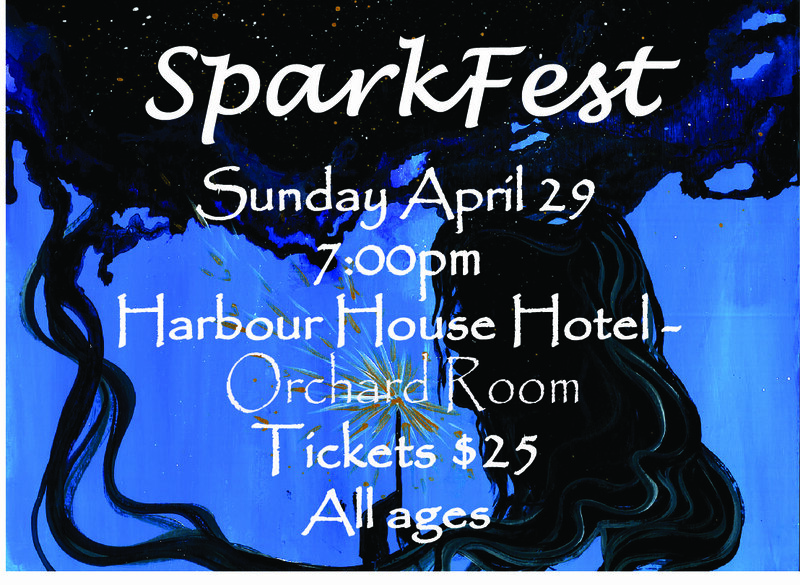 Sparkfest is held this year at the Harbour House Hotel on Salt Spring Island, in the Orchard Ballroom, creating a classy venue for participants and performers alike. The show starts at 7:00 p.m. on Sunday April 29th at the Harbour House Hotel. Doors open at 6:30 p.m. Tickets are $25.00 and all proceeds go to supporting SWOVA and next year’s Pass It On Program. Tickets are available at B Side, Salt Spring Books, SWOVA, and at the door. Sparkfest is open to all ages. Children under 12 are free. Price of admission gets you free desserts created by the Harbour House Chef and the female mentors will be serving mocktails. There will also be a silent auction with donations from the community. The opportunity of potential financial support is one of the key reasons for running Sparkfest. There is an incredible line up of local female performers Including, international singing sensation, Hey Ocean! The Pass It On Program is an initiative that aims to empower and support adolescent girls by providing education and skill building to help them stay safe. The project has two key components. The first is to engage high school adolescent girls in a dialogue around the most pressing issues they face in today’s society. The second component involves a cross- age mentoring project that connects high school adolescent girls with middle school girls to provide them with support as they navigate the waters of middle school. Senior high school young women are trained and supervised to be mentors for middle school girls and meet once a week through the length of the project. The main objective is to increase the capacity of young women and girls on Salt Spring Island in the areas of leadership, self-care, safety, and accessing community supports. To prepare the mentors, they receive training and meet bi-weekly. With increased skills in communication, problem solving and leadership, the older females are more able to facilitate helpful conversations and to form supportive relationships with their younger partners and assist with the transition to high school. In a small island comunity, it is common that there are more intergenerational events (parties, dances) where mixed ages are in attendance. When children are young, they are often brought to community dances. This intermingling of the ages seems to continue well into the teens. Reinforcing this, it is very important for young women to feel comfortable connecting with those in an older age range and to be exposed to positive role models. Through knowing those of an older generation and being aware of their issues and how they think, such intergenerational relationships may de-stigmatize assumptions based on age and develop an understanding and appreciation of each other. Mentorship fosters a net of safety and confidentiality, so crucial in small communities. Consequently, this year we have widened the circle for more group activities for both mentors and buddies, along with the inclusion of young professional women in the community to share their experiences and passions from time to time. The stories and journeys of these invited female guests have inspired passion, initiated dialogue, and offered options that the young teens had not yet considered. And the guests have all remarked on the openness and respect of the young mentors. This is intergenerational capacity building at its finest. Respectful Relationships (R+R) is a National and Provincial award winning schools-based primary violence prevention program for youth, developed by SWOVA. SWOVA has spent almost a decade of research and development, refining ideas about how to stop bullying, interpersonal, partner, and family abuse, through ‘relationship education’ with youth. Their efforts have grown into an effective 4-year, 48-session curriculum that addresses bullying, sexism, racism, and homophobia, with a focus on the development of healthy, non-violent relationships among adolescent youth (male and female). Both male and female adult facilitators deliver the curriculum. This partnership is crucial in modeling respectful relationships in action between genders. In addition, some of the curriculum occurs in separate gender circles, necessitating the facilitation skills of both male and female facilitators. SWOVA has traditionally provided training to new adult facilitators through a face-to-face intensive 5-day model. It has always worked best to have a critical mass of new facilitators requiring the training and to bring them to one location. As with any face-to-face model, it comes with its own logistical challenges. While often touted as optimum, due to opportunities to practice facilitating segments of the curriculum to a receptive and forgiving audience of colleagues, it is an expensive option. A final reflective written assignment and discussion group participant feedback. Participants in the on-line training will be preparing to facilitate the R+R curriculum over six weeks. Participants will be guided through the process with a moderator who will be available through email, SKYPE and phone. In addition, the moderator will facilitate weekly group calls as well as coach participants during one-on-one coaching calls.